1 Battery, 2 Ignition switch, 4 Engine fusebox, 5 Passenger fusebox (28 fuse), 9 Built in systems interface (BSI), 98 Cigar lighter, 99 Clock, 100 Audio unit (2030 model), 101 Satellite controls, 102 Electric aerial module, 103 LH rear speaker, 104 LH tweeter, 105 Passenger's front door speaker, 106 RH rear speaker, 107 RH tweeter, 108 Driver's front door speaker, 109 Sunroof assembly. Wire colours: BA White, BE Blue, BG Beige, GR Grey, JN Yellow, MR Brown, NR Black, OR Orange, RG Red, RS Pink, VE Green, VI Mauve, VJ Green/Yellow. Note for the Cigar Lighter: Note fuse 23 may be supplied directly from battery or via ignition switch. Note for Audio unit - 2030 model: Note fuse 24 may be supplied directly from battery or via ignition switch. 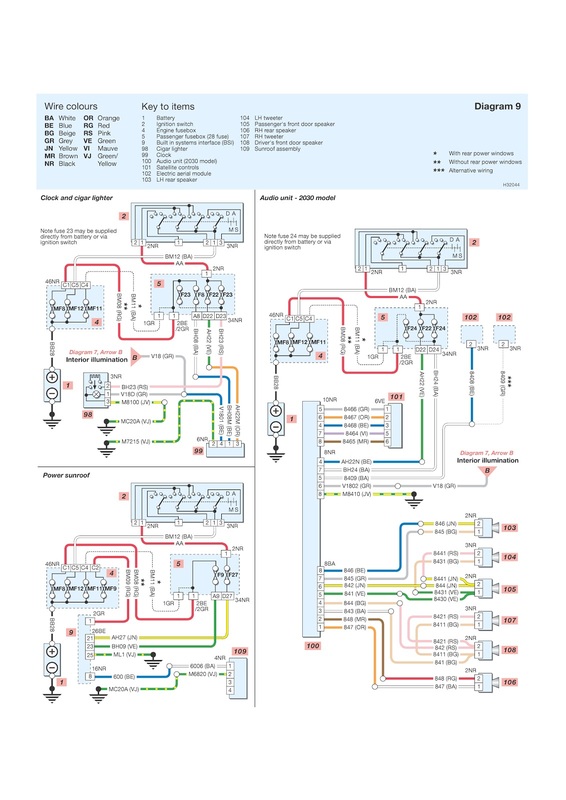 After noticing the whole description on Peugeot 206 System Wiring Diagrams Clock, cigar lighter, sunroof, audio system, hopefully, you will be able to do your work successfully. Here the vivid and readable color schematic wiring diagrams for the Peugeot 206 System Wiring Diagrams Clock, cigar lighter, sunroof, audio system. Click on the image to enlarge. Or using picasa photo viewer for best view.